Last week I got a wonderful surprise, we were nominated for “One Lovely Blog Award” by Erin and Sky! We work hard trying to come up with ideas and posts that amuse us, erhm, I mean YOU guys, and to be appreciated is just such a treat! So THANK YOU! 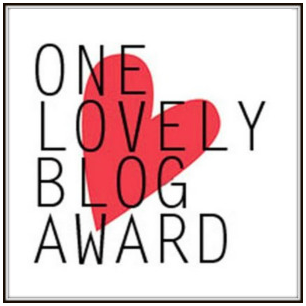 The “One Lovely Blog Award” gives us bloggers a chance to 1. Give much deserved recognition to our favorite blogs. 2. Share our favorite blogs with our readers (where we go to for inspiration and fun). And 3, it gives the readers a few interesting tidbits about the people behind the blogs. About the award: I did some searching around online, and the award is really not a nomination, as much as it is a recognition from your readers that you are appreciated – the nomination is the award, and vice verse. Getting feedback like this is WHY we all blog, so I am just thrilled to get to be part of this! Thank you to Erin of Erin and Sky for nominating me for this award. You should absolutely take a look at her blog! She draws, designs, paints, scrapbooks, most of all is a fantastic crocheter – and self-admitted geek! Below is one of her wonderful hats! (I am answering the questions below, since I am the admin and most frequent poster on the blog. But BIG GIANT THANKS and KUDOS to the guest-authors, contributors and muses: Jedi master Heidi, The Hubby, Master Builder Peter, M4P Mom, Amy and Gene Ha! THANKS GUYS! This blog started as a learning tool. I am designer for a living, and needed to learn more about integrating all the social media platforms, and what better way to learn than to do. Turns out the blogging was so much fun, that I kept at it… and even enlisted a few people along the way. I am becoming more and more of a “tree hugger”. I see what we are doing to this earth, and it terrifies me. So we work hard at recycling, up-cycling, free-cycling, donating stuff instead of throwing it out, buying used and take/give hand-me-downs, as well as trying to conserve our resources (water, gas, electricity). And we are starting to really notice that more is not better – it is just more! I ADORE Opera. The first time I got to go to the Met in New York, I was in tears throughout most of the performance. Our house is NOT decorated in all Star Wars decor, nor do we have crazy amounts of Star Wars gear. Though I have to admit, I am wearing a Yoda T-shirt while writing this. Lastly, and most importantly, I am a Christian. The most important part of our day is when, as a family, we sit down to pray. God asks us to love our neighbors and to continually try to make the world a better place. So with that, we pray that we do not “throw stones”, but live with love and are good stewards of this earth. If I could add a #6, I would add: make sure you visit the links of you fellow nominees – I know you will find some amazing stuff there, maybe even a new favorite blog! I hope you enjoy them! I have a very diverse movie taste, so there ended up being a bit of everything on the list: Rom-Coms, Animation, Action, Indie movies as well as “Critics'” favorites. And I am pretty lucky, the Hubby has a VERY similar (and diverse) taste, so we hardly ever argue about what movies to watch. (Though he would definitely put the Lord of the Rings series in there too – and absolutely remove Moonstruck.) The best movies we have seen recently are Mad Max:Fury Road and Trainwreck.